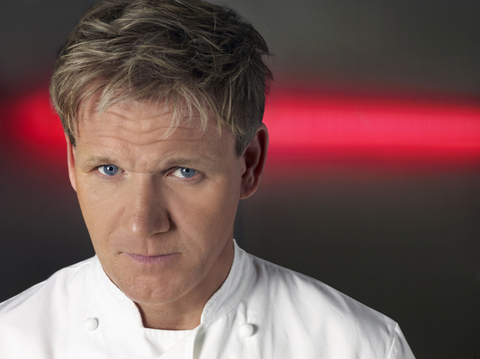 Given the number of restaurants in his empire (as it were), Gordon Ramsay would be a very busy man even if he didn’t have a TV series. As it happens, however, he actually has four of them: “Hell’s Kitchen,” “Kitchen Nightmares,” “Masterchef,” and, most recently, “Hotel Hell.” With less than a 10-minute window available for a chat after his appearance at the Television Critics Association press tour last month, Chef Ramsay and I didn’t have a chance to get terribly in-depth about any topic for Bullz-Eye, but I was able to get a little bit of insight into how he transitioned from the soccer field to the kitchen, how he handles himself behind the camera, and how long his “Hell’s Kitchen” winners tend to stick around his restaurants. Gordon Ramsay: So has my daughter. [Laughs.] I have three daughters – 10, 11, and 13 – and Megan, the oldest, said, “Daddy, I can cook scallops better than any of your sous-chefs on ‘Hell’s Kitchen.’” So it gets a little bit embarrassing. But, you know, it’s not the one portion, it’s cooking for an entire restaurant that gets them, because it’s down to the timing. No one can prepare you better for that service than experience. You can’t just walk into it. You’ve got to be prepped big-time. So I suppose the big frustration at home, with everyone saying, “I can do better than that,” is because they’re looking at one portion. Yet the most important thing is cooking the scallops perfectly across the entire night. BE: To start at the very beginning, I understand you were actually on your way to a career in football – by which I mean soccer, of course – at one point.